An idea, born two years ago, has just taken shape: our on-line bookshop. You can henceforth order and pay without exchange of e-mail or mail. However, the paper of books continuing to refuse with stubbornness to pass by the pipes of Internet, we decided to maintain the mail service for the shipping of the books at their addressees until a better solution is found. 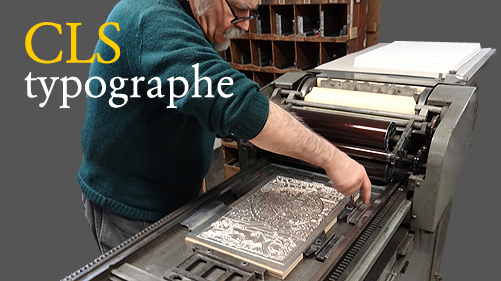 We do not envisage either, at least not yet, that goes without saying, to proceed to the dematerialization and to the digitalization of lettrepress printing, screen printing, line-engraving, lithography, and other traditional techniques we use in the realization of our books. To reach the on-line bookshop, the gesture is simple. You just have to click the option Online bookshop of the menu bar or click the opened book in the box Online bookshop, at the top of the left column (copied under in didactic purposes). As for the internal functioning of the bookshop, we leave you to discover it by your own means. Nothing prevents you, however, from asking us some question if the need arises. We shall civilly try to answer it as soon as possible.